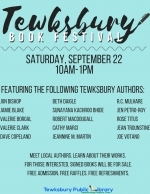 Celebrate local authors at the library's 2nd Annual Tewksbury Book Festival. This author fair includes a diverse collection of 15 writers, all with ties to Tewksbury. Drop in anytime during the 3-hour event to meet these local authors; learn about their books; enjoy complimentary donuts (10am-11:30am), pizza (11:30am-1pm), and drinks; and enter to win free raffles. Signed books will be for sale. No registration required.